February is right around the corner, six days to be exact, which means the holiday of love is too. I’ve heard my husband say it before; girls are hard to shop for. Well, let me make it a little bit easier for each of you with a Valentines Day Gift Guide For Her. 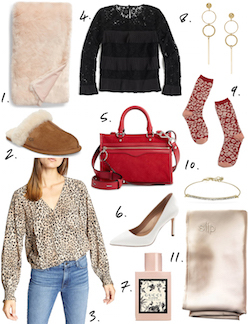 Shop some pieces that I am loving and that make great gifts for the gal in your life! 1.Faux Fur Throw Blanket: I have these faux fur throw blankets all over my house. They not only look cute thrown over the back of your couch, but they are also the perfect blankie to cuddle up in on a cold, snowy day! 2.UGG Slippers: Who doesn’t love a great pair of slippers? These by UGG are amazing, and keep your feet so warm. 3.Sanctuary Leopard Top: Leopard is completely on trend this season, and I am not mad about it. This top is perfect for weekend wear or if you need something a little dressier. Dress it up with a black skirt and a pump for a day of work or dinner with friends. 4.J.Crew Lace Pleated Top: How adorable is this layered lace top? Pair with distressed denim for a casual look or wear it with a wide-legged slack for a day at the office. This fun and flirty top also comes in a beautiful red color! 5.Rebecca Minkoff Mini Red Handbag: I love a good pop of color in an outfit. This red Rebecca Minkoff bag does just that to your look. With multiple compartments and compact shape, this bag is functional and adorable. 6.Banana Republic White Pump:This has got to be one of the best things ever. The Madison 12-hour pump officially comes in white, and to say I am ecstatic is an understatement. Every woman needs a white pump, especially with spring right around the corner! 7.Gucci Bloom Perfume: Perfume is a personal preference but I have found Gucci Bloom to be one of the best across all boards. Its light floral scent is great for everyday wear, plus, the bottle is so cute. 8.Uncommon James Earrings:I am such a big fan of Uncommon James. Their jewelry is high quality and is reasonably priced. This pair is great for casual looks but also can be worn for a dressier occasion, such as a wedding. 9.Leopard Fuzzy Socks: A girl can never have too many pairs of fuzzy socks. I love the touches of red and pink for the perfect Valentine’s Day vibe. 10.Uncommon James Bracelet: Does your gal love jewelry but she is a huge earring girl? I love this bracelet that is also by Uncommon James. It is the perfect delicate bracelet that she can wear every day with everything. 11.SLIP pillow case: I have mentioned this pillowcase multiple times on my blog! A SLIP pillowcase is made entirely out of silk. It is recommended by dermatologists and plastic surgeons, because of its ability to help with anti-aging, anti-sleep creases, and anti-bed head for an eight-hour beauty treatment every night. They come in an assortment of fun colors!